There are several ways to create effective Scrum Masters or Agile Team Coaches (referred to as “Agile Coaches” moving forward). Here are some of the ways. Letting your own coaches figure it out. 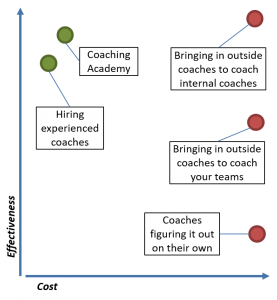 Bringing in outside coaches to coach internal coaches. Bringing in outside coaches to coach your teams. Hiring experienced coaches as FTEs. Using a self-paced training method where your coaches can learn on the job. Each of these has their own level of costs and effectiveness as shown in Figure 1. The cost shown is not just cost in dollars but the cost of not having qualified coaches. Let’s go through each of these. Letting your own coaches figure it out. Many companies are forced into this choice because of lack of budget. The result, however, is poor coaching and often poor agility. Taking a 2-day Scrum Master class provides an insufficient start because it typically does not provide the why of the immutable roles, events, artifacts, and rules of Scrum. Fledgling Scrum Masters are left to “follow Scrum” without the deep understanding required to apply it to the teams they are coaching. While inexpensive in dollars, it has a high cost in time and frustration. Bringing in outside coaches to coach internal coaches. This can be the most effective approach if you bring in people who coach your coaches to be coaches. Make sure they don’t get seduced into just mirroring Scrum or doing the work themselves. It is just expensive. Hiring experienced coaches as FTEs. Hiring experienced outside coaches can be effective because you are adding experience to your teams. This is also a great approach when none of your existing team members want to be coaches. The challenge, however, is if you don’t want to allocate people full time to a coaching role. The risk with this approach is if you force people into it who don’t really want to learn the role. However, most companies have people with considerable Agile experience and just need a supporting framework to help them grow. To see an example of this type of training see the Net Objectives Coaching Academy for Scrum Masters and Agile Team Coaches. To learn how to apply this across your organization for the cost of training three or four Scrum Masters a month, see Coaching Academy for Large Organizations.